Welcome to our seventh block from Pat Sloan in her FREE 2014 Mystery BOM! For July Pat is taking us to the land down under's largest city, Sydney! This month's block was inspired by Pat's dreams of visiting the beautiful city of Sydney. Let's explore the resources Pat has put together for you this month, and feel free to share on Flickr after you create YOUR block! 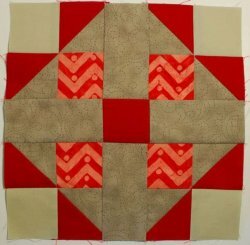 Download BOM Materials List and Block Seven Pattern! Click Here to download the PDF of the pattern for Block Seven: Sydney. UPDATE: Pat has provided an updated version of the pattern to correct typos.